SpongeBob Squarepants is a funny, if mildly annoying, Porifera sponge. He dwells in the ocean, has huge pores and seems to be boneless. 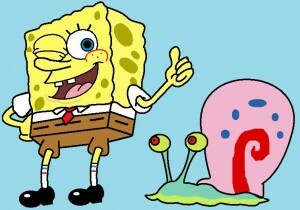 If Gary were a shrimp snuggled into SpongeBob’s side, instead of a snail sharing his pineapple, it would be closer to real life. Learn about the life of a real Porifera living on the ocean floor…. 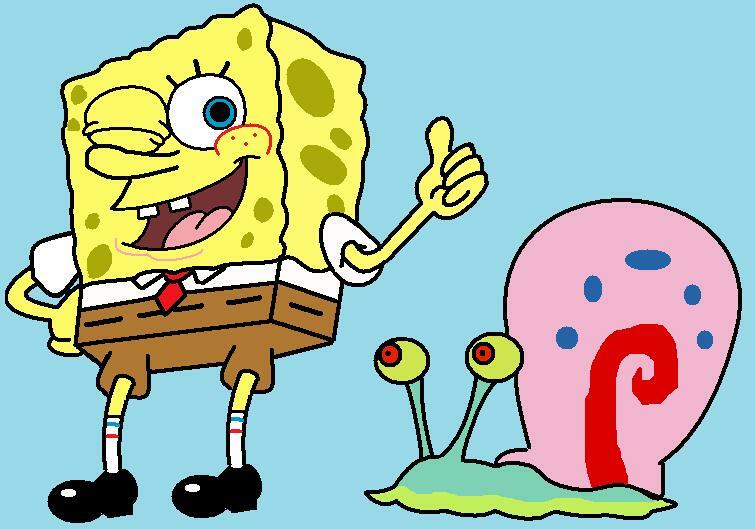 Easy Science for Kids All About Porifera Sponge Facts – Image of Spongebob, a Sea Sponge. 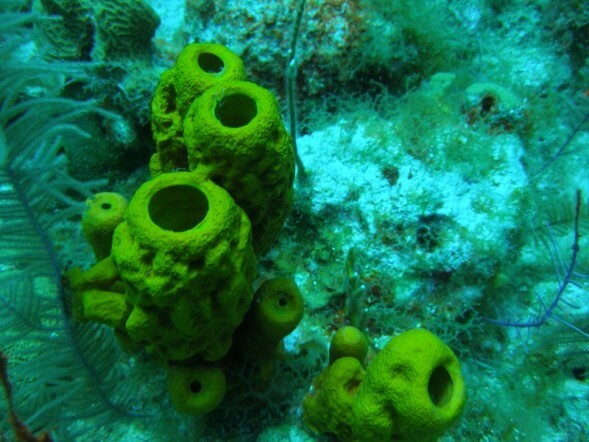 Most Porifera, or sea sponges, are Sessile Metazoan animals; they don’t move. They pick a spot on a rock, sandy ocean floor or even another animal, latch on and stay put. There are a few sponges that can move. They race along the ocean floor at a whopping 1-3 millimeters (that’s right, millimeters) a day! Found in water ranging in depth from tidal pools to 5.5 miles, these Porifera sea sponge animals have no tissues or organs in their bodies. So how do Sponges eat? Each cell individually digests its own food. They need constantly moving water to bring food to them through pores near the bottom of their bodies. Then Porifera sponges use stringy, tentacle like Flagellae to help move water through their internal channels, passing through various cells, where food and oxygen are filtered out of the water and digested, while waste is left in the water to be expelled through the top of the body. If water is particularly sandy or dirty, a Porifera sponge can close its intake pores partially or all the way, so its cell walls don’t get clogged up with incoming trash. Kind of like a storm drain on the street all packed with litter. Imagine all that junk trying to get down your throat: That is probably how a sponge feels in polluted water. 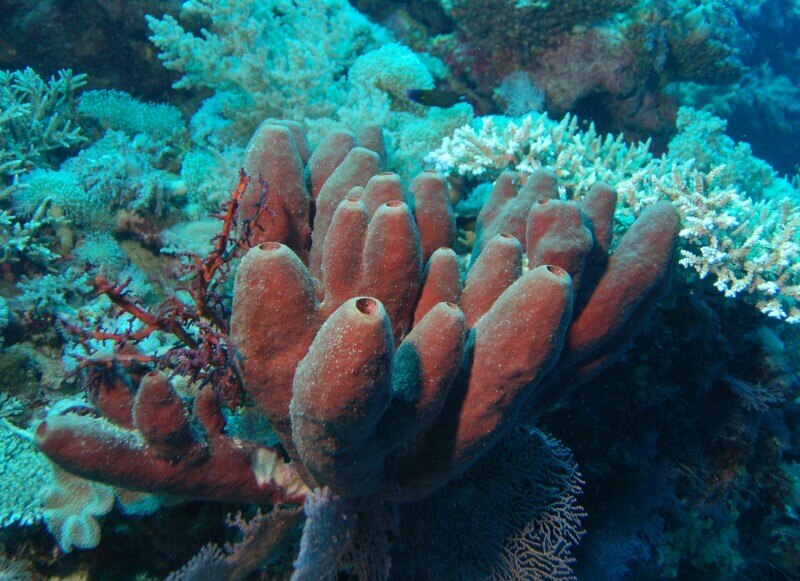 Of the more than 5,000 different species of sponges, only 150 live in fresh water. Carnivorous sponges can trap small Crustaceans on the Velcro-like spicules of their outer layer. Then cells spread and form around the trapped creature secreting chemicals to digest it, making a lovely lunch for the sponge. There are three types of sponges and they differ by shape: Asconoid sponges are a simple tube shape; Syconoid sponges are larger and thicker tubes; and Leuconoid are the largest sponges shaped as lumpy masses riddled with canals. Individual cells digest their own food. Some tropical and deep-ocean sponges can live for 200 years or more. The oldest fossils on the planet are of sponges about 600 million years old. Sponge skeletons are made of protein, collagen and spicules. 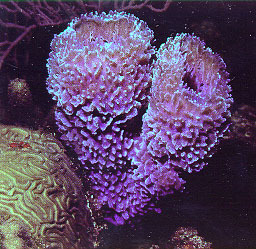 Sponges can change the shape of their bodies. Gemmules: a cluster of cells within a sponge that contain all the different cells to create a new organism. This “life pod” can go dormant during severe conditions and then revive when conditions improve and the sponge can survive. Question: Do sponges move at all? Answer: Sponges hardly move at all. They can move, but they do it very slowly. Some sponges move even less than a millimeter each day. Even if they move, you probably won’t even see it happening! Enjoyed the Easy Science about Porifera for Kids info? Take the FREE & fun quiz on Porifera for kids and download our FREE Porifera for kids worksheet. For lengthy info click here. Declan, Tobin. " Porifera Facts for Kids ." Easy Science for Kids, Apr 2019. Web. 18 Apr 2019. < https://easyscienceforkids.com/fun-facts-on-porifera-for-kids/ >.